“Though we cannot replace the lives lost during super typhoon Yolanda, we can help in erecting structures that will serve as safe havens for the public school children of Tacloban City,” Ayllón added. EDUCATION STALWARTS – Philippine Business for Social Progress (PBSP), Insular Foundation and the Department of Education partner for the construction of a classroom building to help Typhoon Yolanda survivors in Leyte. In photo during the Memorandum of Agreement signing are: (from left) Rafael C. Lopa, PBSP Executive Director; Vicente R. Ayllón, Insular Life Chairman of the Board and CEO; and Mario Deriquito, DepEd Undersecretary. 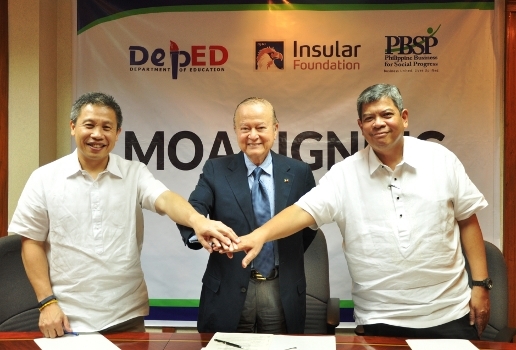 Insular Foundation, Insular Life’s corporate social responsibility arm, recently signed a partnership with Philippine Business for Social Progress (PBSP) and the Department of Education (DepEd) for the construction of a classroom building in San Fernando Central Elementary School in Tacloban, Leyte. The school has one of the biggest student populations in the area. Before Typhoon Yolanda struck, San Fernando Central Elementary School had already been making do with crowded classrooms, fitting in 2,940 students in 35 classrooms. “Insular Foundation has directed its Corporate Social Responsibility efforts towards creating access to quality education for the financially challenged but deserving students through our college scholarship programs that date back to the 1960s. This is the first time that we will become part of a program of a project that literally builds brick and mortar structures to house hundreds of students as they go about their everyday school life. We are very happy that we can be part of the Department of Education’s effort in constructing a disaster-resilient building,” said Insular Life Chairman of the Board and Chief Executive Officer Vicente R. Ayllón. The contribution will assist in the construction of a single storey- three-classroom building that can withstand the usual disasters that visit the country. Ayllón shared that the province of Leyte has a special place in his heart because his mother is a native of Samar. With the project starting in December, Ayllón is thankful to be part of the partnership and hopeful that the shared mission will result in the healing and recovery of the child survivors. “We thank the Department of Education, Secretary Armin Luistro, represented by Undersecretary Mario Deriquito for the exemplary work that they have done for our schoolchildren and teachers. We thank Philippine Business for Social Progress for being our implementing partner in the construction of the school building and we’re honored to be your partner in this very worthy school building project,” he said.